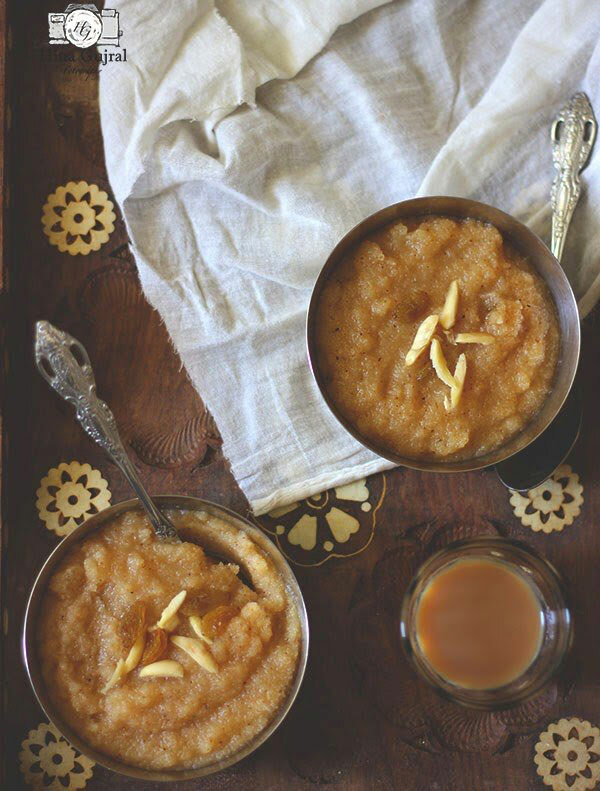 Suji Ka Halwa is simple, delicious Indian style semolina pudding, made with basic ingredients – semolina, sugar, and ghee. Regardless of these humble ingredients, the suji ka halwa tastes simply divine and provides a kind of comfort to the one’s culinary senses. It is a perfect comfort food. Halwa is a common variety of Indian dessert widely made across the Indian sub-continent. It could be made with a divergent combination of day-to-day ingredients. 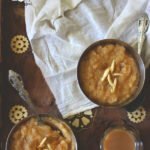 Suji Ka Halwa is no modern-day fancy pudding, on the contrary, it is been made in every Indian kitchen since the time immemorial, yet every household has its own peculiar individual taste of sooji halwa. 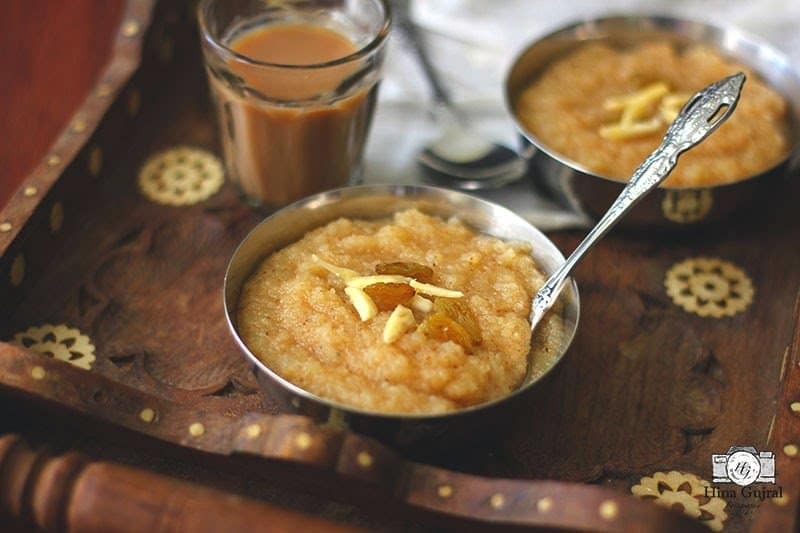 Suji ka Halwa was a staple dessert during my growing up years, no festive meals, birthdays celebrations, rainy days, gloomy days, were considered complete without the large bowl of suji ka halwa on the table. But all this while I never considered this pudding something which requires a certain skill set, the reason being, my mother making it so frequently and with much ease that I assumed there is not much to learn behind the scene. 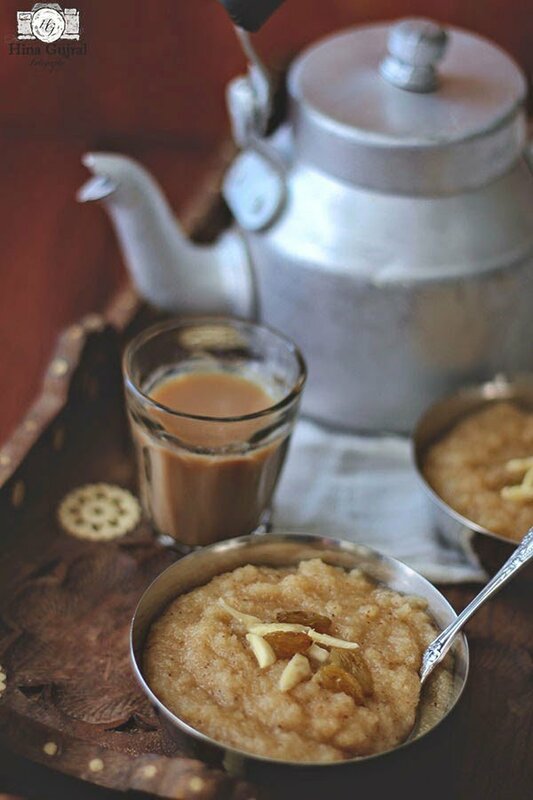 When I first made suji ka halwa as a newly wedded bride, it was nowhere near to perfection. Since then every time I make suji ka halwa it improves one step ahead, and I am still learning it hard way. My mother was never very familiar with the western baked desserts, she is a simple lady coming from a humble background but she always has this sweet tooth, which my brother and I have inherited from her. 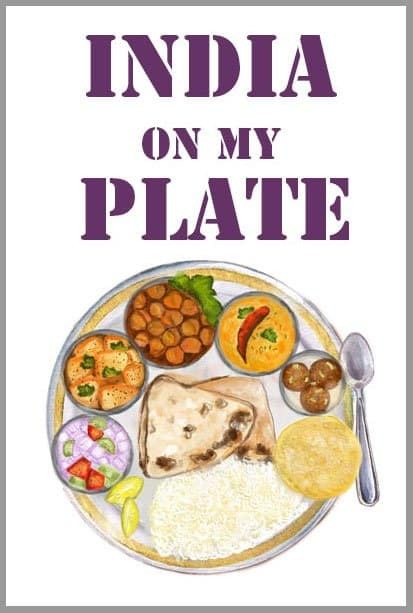 To satiate our sweet cravings every now and then, she would stir up some halwa during the cold winter nights (Also read: 8 winter comfort food from India). The process of making suji ka halwa is quite straightforward, elementary, undemanding but not effortless. The only secret mantra behind the triumphant bowl of sooji halwa is the slow roasting process of the semolina. The more semolina is slowly roasted, better the flavor and color of the halwa. There aren’t any cheat shortcuts to fast forward the roasting process of semolina, and the whole suji halwa making exercise in itself is very calming and therapeutic. 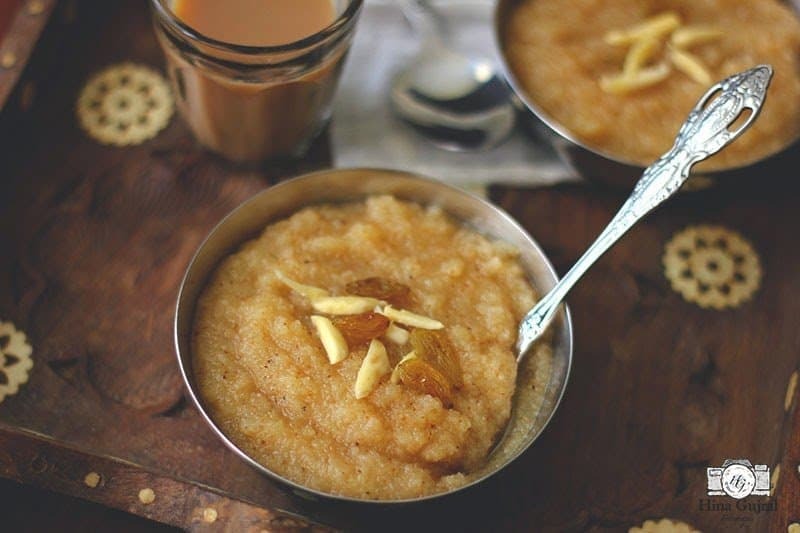 Suji Ka Halwa is simple, delicious Indian style semolina pudding. Learn how to make perfect sooji halwa in a few simple steps. In a heavy bottomed pan heat ghee over medium heat. Add semolina, reduce the heat to low and saute semolina over low heat till it turns deep brown in color, stirring continuously in between. Stirring is essential while roasting semolina so that it gets evenly roasted. Roasting semolina over low heat is a time taking task. For more efficiency I usually keep myself engaged with other chores in the kitchen while semolina is getting roasted. Once semolina is roasted add water and stay a bit far away from the pan as there is a lot of bubbling and splashing. Once semolina calms down a bit after adding water stir continuously to avoid lump formation. Add sugar and cardamom powder. Stir once again to combine. Keep the flame to low. Cover the pan with the lid and let halwa cook for 5 - 10 minutes over a low heat. Remove the lid of the pan, stir, turn off the heat. Suji Halwa is of dropping consistency, if it seems too liquid, let it simmer for few more minutes over low heat. Transfer suji halwa to serving bowls. Garnish with sliced almonds and pistachio. Serve warm. Some people like to add an equal amount of ghee as semolina but the end result with less amount of ghee is delicious too. 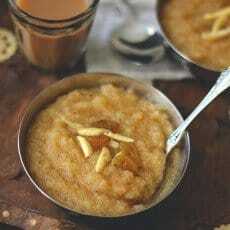 The secret to making a spoon-licking suji halwa is slow roasting the semolina till it changes the color to deep brown.